Monikers only takes about 5-10 minutes to learn. Start by dividing your group into 2 teams. Deal 10 cards to each person. Everyone secretly chooses 5 that they like. Shuffle all the cards people chose into one deck, which will be used by both teams for the entire game. Put the other cards back in the box. You want to aim for using around 40-50 cards in the deck, so deal fewer and choose fewer when playing with a big group, and deal more and choose more with a small group. The team with the best story about meeting someone famous goes ﬁrst. Or totally random. 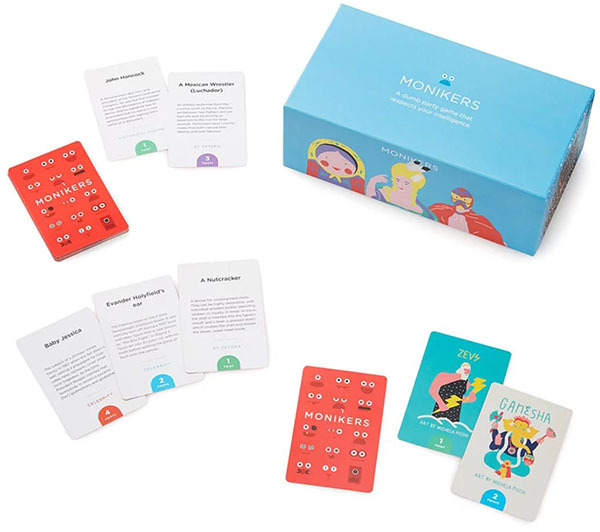 Monikers is played in 3 rounds. 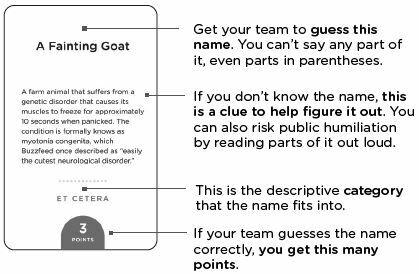 In each round, a person from the starting team has 60 seconds to get their team to guess as many names as possible from the deck by giving clues about the person's identity. (If you're playing with 10+ people, go with 30-45 seconds to give everyone a chance to give clues). There's no limit to the number of guesses. Skipping is allowed and highly encouraged. Teams keep the cards they guessed correctly to score after the round. Reshue skipped cards into the deck after each turn for the next team to use. Teams take turns giving clues. Each player should take a turn giving clues before any teammates repeat. Go in clockwise order or feel free to use some other system. A round ends when all cards from the deck have been guessed correctly. When that happens, teams add the point values from each card they correctly guessed. Write those numbers down somewhere, then shuffle all the cards back together into one deck for the next round. The team with the lowest score begins the next round. Use any words, sounds, or gestures. You can't use the name itself. If you use any part of the name, you have to skip that card and shuffle it back into the deck. Reading the clue text is allowed. Use only 1 word as a clue. It can be anything except the name itself. You can repeat that word as much as you like, but no sounds or gestures. Just charades. No words. Sound effects are OK (within reason). The team with the highest total score after 3 rounds wins. But feel free not to keep score at all. It's fun to play competitively, but not necessary. If you have any unanswered questions, contact us or just go with whatever works best for your group. Having fun is more important than getting the rules perfect. For Round 1, Justin is giving clues to his team. A player from the other team is keeping time and starts a 60-second timer. Justin draws the first card from the deck: Count Chocula. Justin tosses the correctly guessed card off to the side and draws the next card off the top of the deck: Pablo Escobar. Teammate: Al Capone! Pedro Escobar! Justin thinks that's close enough, so he counts it as correct and moves on (the other team is free to argue about it after his turn is over). He draws another card from the top of the deck: Ceiling Cat. Justin: This is a cat that-oops, skip. Because he accidentally said part of the name, he has to skip that card this turn. He draws another, but before he starts to give the next clue, the timer beeps, so his turn is over. He puts the cards his team guessed correctly in a stack with the others from earlier this round. He also reshuffles the cards he skipped into the remaining deck of unguessed cards. Someone from the other team takes the deck and begins their turn.